I promised you more of our sneak peak at the new Anatex waiting room collection but I thought I’d share my thoughts about a couple of last years products. I have been looking through the pictures and video I took at the photo shoot. I am so excited about the new products and even the new pictures of some of our old favorites. For example, although they debuted last year I had not seen the Anatex Fire Engine or Submarine Activity Centers in action. My son Jack could not decide which activity toy he liked better. In between set changes he kept walking off the set to play with both of them. At first I thought the Fire Engine Activity Center had stolen the show. He spent at least half an hour spinning the steering wheel, pretending to honk the horn, and shifting the gears. 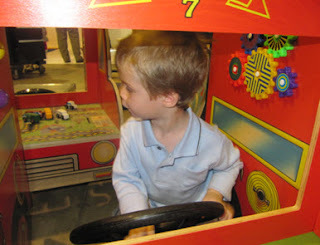 He loved the pathfinder vehicle maze and gears on the side with the colorful fire engine graphics. When the set designer put the vehicle themed toys away to roll out the under the sea waiting room toys I thought Jack was going to go off the set to keep playing with the Fire Engine. Although he started to follow it as it was removed from the set he ran right back when he saw the Submarine Activity Center take its place. I know the eye-catching graphics drew him in but the innovative design kept him playing for a long time. 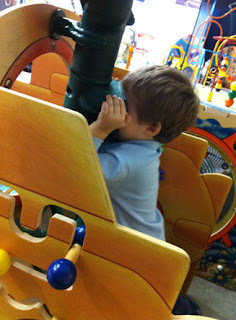 He could not get enough of the working periscope. He kept looking into the viewfinder amazed that he could see up and out the other side. Then he would pretend to drive the submarine around using the steering wheel and would shift the gears. Next he played with the boats on the pathfinder toy and then the gears. He absolutely loved this activity center. It was so much fun to see how much he loved this activity center. It makes me feel so good to know that our customers at SensoryEdge are getting such a good value for their waiting areas and classrooms.